problems he has a large family, consisting of his female partner, who is locally known as Timmie and their six pups. The human world is pacing in speed day by day without even noticing the agony of these creatures. People are always shooing the strays away. A little kind gesture of ours towards Bonzoi and his family and millions of other strays like them, cannot change the world but can change the world for that very animal. http://www.dogsandpupsmagazine.com/wp-content/uploads/2017/05/1254nal.jpg 0 0 Dogs and pups Magazine http://www.dogsandpupsmagazine.com/wp-content/uploads/2017/05/1254nal.jpg Dogs and pups Magazine2014-03-19 16:38:562014-03-19 16:38:56Bonzoi the struggling stray! Tail wagging, eyes hoping, seeking love, attention, food – you can easily spot them keeping a watch in your neighbourhood. Here’s a dog who is lovable, adorable and tough, with a determination to survive and living life against all odds. Heat, cold, rain, traffic, fights, no veterinary care – this brave heart goes through it all alone. 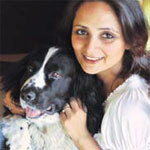 Yes they are our own – The GREAT INDIAN Dogs – a term given by Mrs. Maneka Gandhi. We have got a continuous feedback to create more awareness so that these angels too can get some help and support. A lot of organisations, individuals, shop owners, restaurants, local vendors are doing a great job in taking, caring and protecting their neighbourhood sweethearts. Vaccinations, animal birth control, creating awareness among children, emergency care, adoption drives- a lot is being done. But still there are so many more who need that care, which needs to come from each one of us. Little actions and kind gestures can help them live more healthy – simple things like driving carefully, providing water, raising voice if you see cruelty, supporting organisations, which are working for a cause etc, all can make a difference. One such initiative has been taken by a group of students in Noida by Adhiraj and his friends who collectively contribute and take care of the furry angels by taking them to their local vet. Kudos to the students who along with compassion have taken action and have created a neighbourhood watch! Another instance I would like to share is – one day I spotted a little child comforting a pup who was frightened, both sat in complete harmony and comfort – the pup just needed one friendly gesture to become happy again. Sparkle also has a trio who watch over him, communicate with him and even come for walks with him. They are Sparkle’s buddies – they all love to communicate with each other. I really wonder what they say and share!!! http://www.dogsandpupsmagazine.com/wp-content/uploads/2017/05/1254nal.jpg 0 0 Dogs and pups Magazine http://www.dogsandpupsmagazine.com/wp-content/uploads/2017/05/1254nal.jpg Dogs and pups Magazine2006-03-13 00:00:002014-02-07 18:07:41A stray thought!